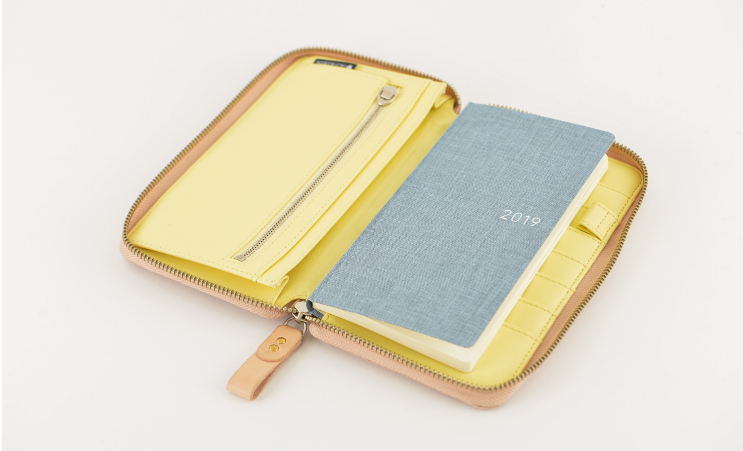 The Hobonichi Techo lineup contains a wide variety of covers that you can pair with your book. Here is some basic information about how to put your cover on your book and how to care for and maintain your cover over continued use. When buying the Hobonichi Techo as a book and cover set, you’ll assemble the set yourself. The cover fits the book quite snugly, but there’s a way to put it on without having to bend your book cover to squeeze it in. See the photographs below for instructions on easily inserting your book into its cover. Open your book all the way up until the front cover meets the back cover. Slide in the front and back cover at the same time. Close the book and you’re all set. Insert a single pen through both pen holders to keep your book closed while storing in a bag. Weeks books are designed to have only one side inserted into the cover. *Weeks books contain designs on the actual book cover, so an additional cover to store the Weeks book is optional. - Wet a clean cloth with water (or water diluted with neutral detergent) and wring out excess water. - Gently tap the cover with the damp cloth. - Place the cover in a shady area with good ventilation so it can dry. *First test an inconspicuous area before cleaning the entire cover. *Avoid using a hair dryer or laundry dryer as this may shrink or distort the material. *Avoid using such extra-strength volatile detergents as benzene and thinners as these may distort the colors of the cover. Use a cleaning brush to lightly wipe away dust and particles from the surface. Rub a small, pea-sized amount of lotion into a soft cloth and lightly apply it to the entire cover. Use a glove cloth or other soft, dry cloth to wipe the entire cover and evenly distribute the lotion. This will give the cover a soft gloss. For leather covers, see here. We hope this guide helps you enjoy your cover to the fullest in the year ahead.